BP-Castrol’s return to Formula 1 as a partner to McLaren-Honda has been announced. This news has got the F1 community rather excited – let’s face it, any new sponsor announcement is a novelty in F1 these days – but it’s perfectly simple and logical step to have taken. Castrol is arguably the most prolific partner to motor manufacturers in competiton, attached to Ford in GT racing, V8 Supercars and the World Rally Championship; Volkswagen Group in the World Endurance Championship, World Rally Championship*, World Rallycross Championship, German Touring Car Championship and European Rally Championship; Volvo in the World and Swedish Touring Car Championships and Kia in Global Rallycross. It is also partnered with Honda teams in the World and British Touring Car Championships, MotoGP and World Superbike championships. Adding Honda’s F1 programme to the roster comes as Audi withdraws from Le Mans and, crucially, allows partner brand BP the chance to produce high-tech superfuels, which it couldn’t in sports car racing because arch-rival Shell is the official fuel provider. Is all of this going to generate excitement in the grandstands? Probably not. Fuel and oil are distress purchases, even to the die-hard motoring enthusiast. The key to selling more product is therefore either to have more filling stations, which are costly to maintain, or to have lots of motor manufacturers bulk buying your products at the source. Ultimately, then, BP-Castrol is moving the chips around in the high stakes game of its commercial relationships with the motor manufacturers. If the contract to supply lubricants to Honda’s customers worldwide comes up for renewal in a year or two, it’s rather handy to have already agreed three years’ sponsorship of the crown jewels, is it not? Nevertheless, the drums are already beating with heritage stories, so let’s have a little look, shall we? Charles Wakefield founded his lubricants company in 1899, and in 1906 developed new, lighter products for the growing number of cars and aeroplanes by adding castor oil – hence Castrol. Meanwhile, BP began as the Anglo-Persian Oil Company in 1909. During World War 1, Castrol was vitally important to many of the engines being put to work in the world’s first fully mechanized conflict, with rotary aero engines needing liberal amounts of castor oil to operate at altitude. Shell cornered the market on high quality fuels for aviation and Burmah and Anglo-Persian produced the heavy oils needed for shipping. After the war, Castrol focused upon motor sport to sell its brand: witness the world record breaking aeroplanes and cars and the associated advertising, be it Amy Johnson’s flight from London to Australia or Sir Malcolm Campbell’s Bluebird on Daytona Beach. Ever since those times, the scrap between Castrol and Shell for hearts and minds has been played out through promoting the sporting successes of their partners. On balance, Shell has held the upper hand in motor sport thanks to 60 wins at Le Mans plus a heritage of Grand Prix wins with Auto Union, Mercedes-Benz, Alfa Romeo, Ferrari and McLaren-Honda (amongst many others). Castrol’s strongest associations have often been in rallying; a legacy of having former BMC and Ford team principal Stuart Turner heading up its communications programmes. It has also focused on the Land Speed Record (although many of the cars and aeroplanes have been fuelled by Shell). In contrast, BP has only played a minor role in developing successful competition fuels. Since the merger of BP and Castrol in 2000, there has been BP branding for its Ultimate branded premium fuel on Ford’s World Rally Championship cars and the BMW and latterly Audi DTM cars but little real technical endeavour. It is certainly going to have to work hard and fast to get up to speed in developing the sacred 1% difference between pump fuel and race fuel permitted in modern Formula 1. The fuel and oil brands are undoubtedly going to trumpet their heritage of success in the months and seasons ahead, which should at the very least make for some interesting diversions at events like the Goodwood Festival of Speed, Le Mans and the more important Grands Prix of the year. It’s all part of the game, and means that there should be plenty to look out for at the S&G when it comes to historic hydrocarbons! *Edit: Since this post was published, Volkswagen has announced its withdrawal from the WRC, effective from the end of the year. 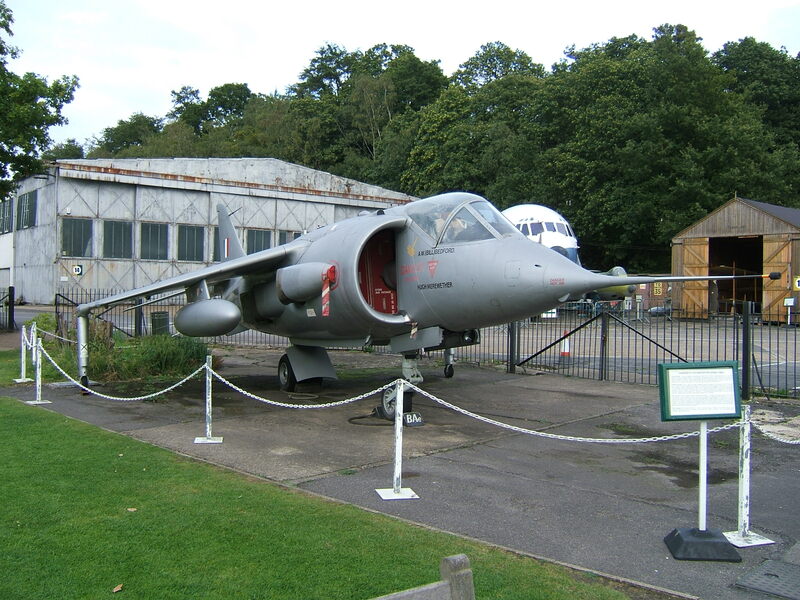 There is dire news from leafy Surrey with the notification that the former home of British engineering hero Sir Sydney Camm could be bulldozed as soon as this coming Monday (April 20 2015), according to the local press. Sir Sydney was the principal designer of Hawker Aircraft Limited, whose most valuable contribution to history was the Hurricane fighter, which effectively saved the free world on two occasions. Although the property developers, Shanly Homes, have been denied permission to demolish the property at 29 Embercourt Road in Thames Ditton, the level of vandalism already carried out in preparation for destroying the house is evident in the pictures. The house was known as Carradale when Sir Sydney Camm lived there from 1930 until his death in 1966. Camm’s career as an aviation engineer began with biplanes and ended in the jet age. He was born in Windsor in 1893, the eldest of 12 children, and earned a scholarship and free clothing in order to attain education until the age of 15 before he became an apprentice engineer. 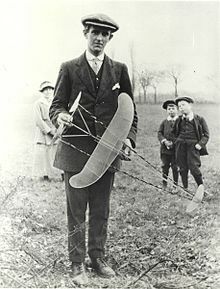 The burgeoning aviation industry had captured young Camm’s imagination completely, and he employed his younger brothers in building model gliders, which were then sold through various means to the well-heeled schoolboys at nearby Eton. He became a founder member of the Windsor Model Aeroplane Club in 1912, earning an honourable mention in Flight magazine for his handiwork. With the onset of the First World War, Camm got a job as a carpenter – his father’s trade – at the Martinsyde aircraft factory at Brooklands. His skills were soon spotted, and he progressed rapidly to the design office, where he would serve out the war. In 1923, the ambitious Camm was taken on by H.G. Hawker Engineering – the firm built from the ashes of the Sopwith company at its original factory in Canbury Park Road, Kingston. Harry Hawker, Sopwith’s test pilot and leading light, had been killed while flying and Camm’s appointment was set to galvanise the still-shaken company into a new era. 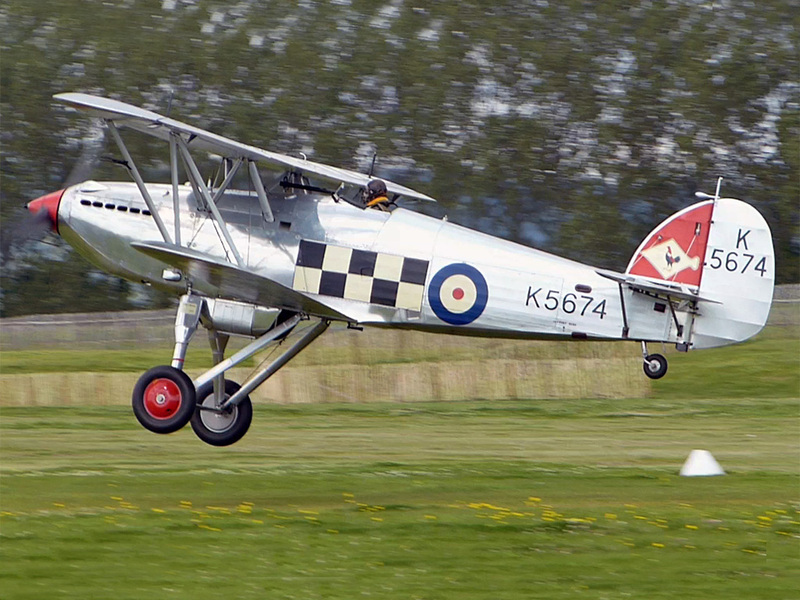 The aircraft that Camm developed at Hawker evolved into a range of powerful military types, including the elegant series of biplanes that formed the backbone of the Royal Air Force and Fleet Air Arm through the 1930s: the Hart, Audax, Demon, Hardy, Hind, Hector and Osprey two-seat bombers and their single-seat fighter siblings, the Fury and Nimrod. At home in Carradale, a warm-hearted family man emerged. He enjoyed reading Evelyn Waugh, playing operatic and orchestral records (his daughter Phyllis later recalled a distaste for solo singers and violinists) and variously fettling his golf clubs, repairing furniture or fixing the family’s shoes – a luxury item, in Camm’s view, that required maintenance rather than replacement. The rebirth of German militarism in the 1930s led to grave misgivings in some quarters that Britain was completely unprepared for any potential conflict. In 1934, the Royal Air Force’s fighter strength was just 13 squadrons of biplanes, while the German industrial heartlands were starting to churn out metal monoplane aircraft that were superior in every aspect of performance and armament. At first Camm submitted a design for a new and more powerful biplane but this was rejected by the Air Ministry – as was his first monoplane design. He returned to his desk and sketched out an aircraft to house a new Rolls-Royce engine, the PV-12, which would later to become famous as the Merlin. Camm’s hard work was almost undone when, in November 1934, the Air Ministry issued Specification F.5/34 which called for fighter aircraft to be armed with eight guns. Work on the modified prototype airframe was completed at the end of August 1935 and the components were taken to Brooklands for final assembly. On 6 November the silver monoplane took to the sky in the hands of its trilby-hatted test pilot ‘George’ Bulman, leading to an intensive programme of development until, in June 1936, the type was approved and the name put forward for it was given Air Ministry approval: the Hawker Hurricane. The Hurricane was immediately ordered into production as it was unclear if the more advanced all-metal Supermarine Spitfire would enter production smoothly. The Hurricane was also significantly cheaper than the Spitfire, requiring 10,300 man hours to produce versus 15,200 for the Spitfire. 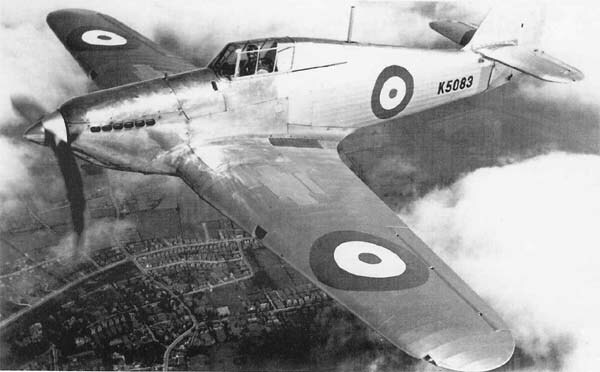 In stark contrast to R.J. Mitchell’s stressed-skin metal Spitfire, the Hurricane employed traditional manufacturing techniques and could be rapidly built in the factory. No less importantly, it could be stripped and repaired quickly by squadrons in the field whose engineers who knew the technology inside-out. The demand for eight guns played to one of the Hurricane’s key strengths: a thick and strong wing section. Four guns sat snugly close to each wing root, making the Hurricane a stable gun platform while the Spitfire – whose slender, elliptical wings forced Mitchell to splay the guns out – would shudder like a wet dog when the guns were fired. The first four aircraft to enter service with the RAF joined No. 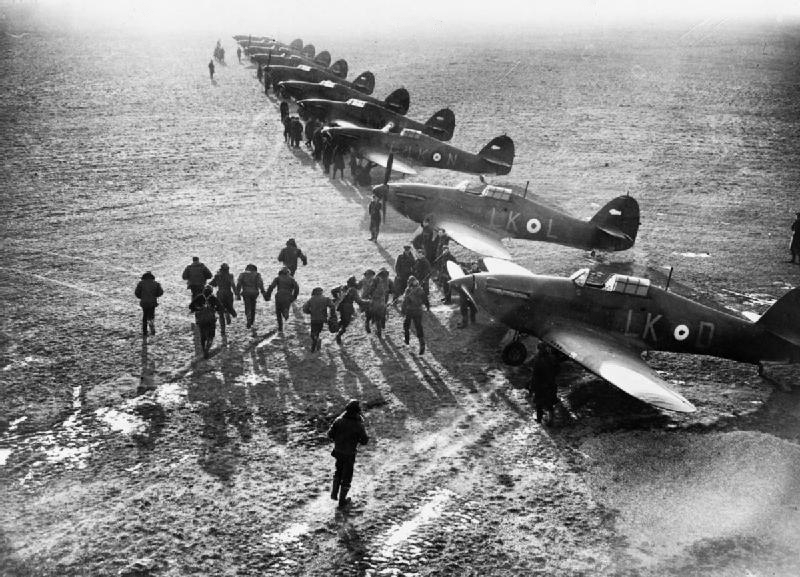 111 Squadron in December 1937. 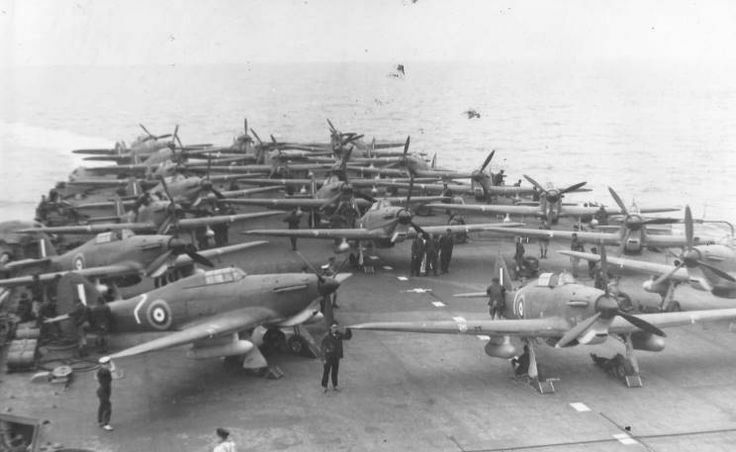 By the outbreak of the Second World War, nearly 500 Hurricanes had been produced, and had equipped 18 squadrons. Production continued to rise and developments such as a metal-skinned wing to replace the original fabric covering and the switch from a wooden two-blade propeller to a de Havilland metal airscrew with variable pitch served to increase its performance. The Hurricane was the only RAF fighter in action during the Battle of France and despite the legend of a whitewash by Hitler’s Blitzkrieg tactics it took a heavy toll on the Luftwaffe – with German records showing the loss of 299 aircraft destroyed and 65 seriously damaged. This record of achievement carried on into the Battle of Britain, in which Hurricanes accounted for 55% of all air combat victories – although in a battle that was in itself a PR exercise, the seductive beauty of the Spitfire was what inspired people to believe that Hitler could be beaten. The Hurricane was not perfect. Its wood and fabric cockpit was cold and drafty for pilots operating at up to 35,000 feet – although in the main it struggled above 20,000 and was thus at a disadvantage to the high-flying Messerschmitts. Its main fuel tanks were to either side of the cockpit and if they caught fire the most natural path for the flames was towards the cockpit, resulting in the majority of early ‘guinea pig’ burns patients being Hurricane pilots. Yet despite these faults, in the early years of the war, the Hurricane was undoubtedly the best solution to meeting the onslaught of Nazi Germany. While the Battle of Britain raged, Benito Mussolini decided to try and win back the old Roman empire in the Mediterranean – and to do so he needed to secure the island fortress of Malta. 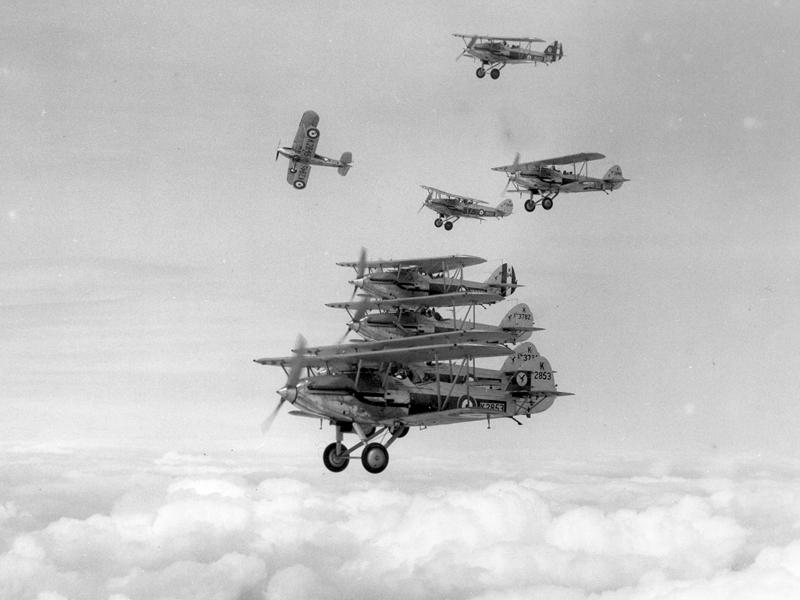 At first his bombers were repelled only by a flight of hastily thrown-together Gloster Gladiators, but soon the Hurricanes arrived. By the winter it was clear that Mussolini had bitten off more than he could chew in the Med, so Hitler reluctantly intervened. He dispatched an army to North Africa to sweep the British out of Egypt and, while licking its wounds from the Battle of Britain, the Luftwaffe pounded the Malta mercilessly. Yet even in the depths of despair for the Maltese there were Hurricanes that held out and offered resistance. Hitler once again had to concede, and in the summer of 1941 turned his attentions towards Russia. He would return at the end of the year, when Rommel had come within an ace of reaching Cairo and the Suez canal – only to have the supply lines to his Afrika Korps virtually severed by RAF bombers and Royal Navy submarines operating from Malta. When the Russian winter forced the armies to dig in, the Germans returned to punish Malta. The plan was to annihilate resistance and allow Rommel to take Cairo, Suez and the oil fields of Iraq and Saudi Arabia – fuel for the Reich and a back door into Russia. Without Malta, British overseas forces would have been forced to flee to a toehold in India, where they would soon have been overrun by the Japanese. With Britain thus neutered, America would have had little alternative but to make terms with Germany and adjust to a new order in the Old World – one in which Hitler was an emperor over all that he surveyed. Yet throughout the summer a stream of Hurricanes had been flown in to the island. Outnumbered, outpaced and outgunned but nevertheless potent, they endured five withering months in which more bombs fell on the tiny island than anywhere else on earth. 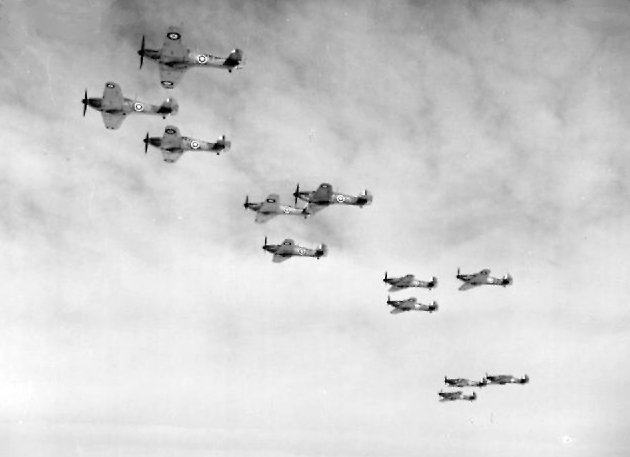 Finally in the spring of 1942 the Hurricanes were relieved by supplies of Spitfires – the first overseas posting for the all-metal fighter after nearly three years of war. The Hurricane continued to serve throughout the war in the Far East, Middle East and Europe, both on land and at sea. Meanwhile Camm had developed the muscular Typhoon ground attack aircraft and its high altitude sibling the Tempest. 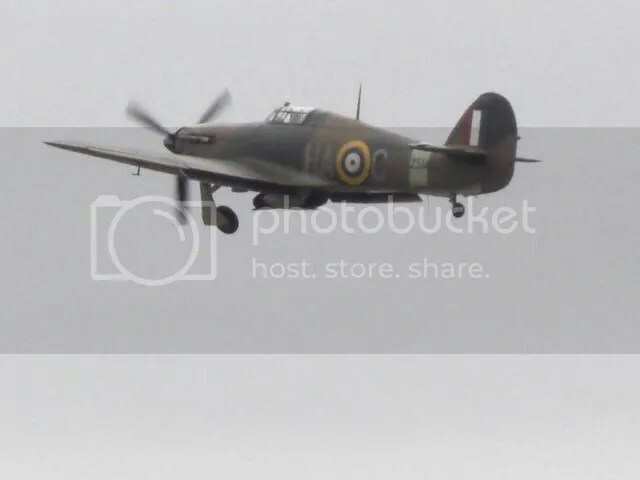 Both aircraft were to play their part in finishing the job that the Hurricane started. After the war, Camm and his team developed new jet aircraft. The Hawker Hunter became the mainstay of the RAF’s defensive forces, but it was the P.1127 vertical take off and landing fighter that was to be his final triumph. Taking to the skies in test flights over Dunsfold in 1960-61, the P.1127 would become the Hawker Harrier, which served mightily until its premature retirement in 2011. Sydney Camm stepped back from work after the P.1127 programme was running steadily. His final years were spent enjoying life at Carradale, playing golf and driving his prized E-Type Jaguar. He died after collapsing on the golf course in 1966 at the age of 72 – leaving behind his latest project: the design of an aircraft to travel at Mach 4. This year we are marking the 80th anniversary of the Hurricane, the 75th anniversary of the Battle of Britain, the 70th anniversary of VE Day and VJ Day, and the 55th anniversary of the Harrier. 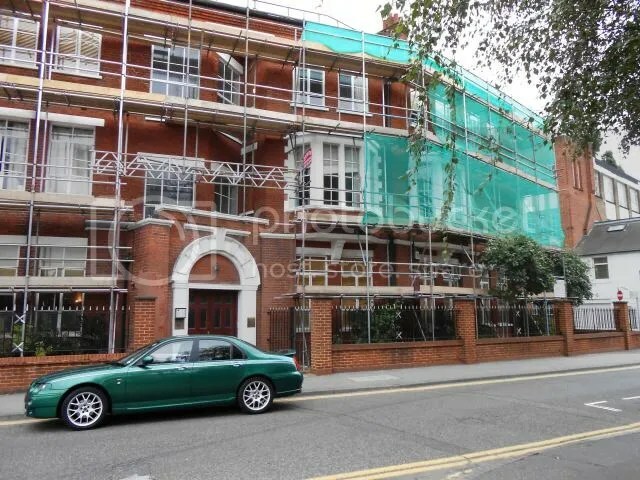 Today Camm’s beloved Carradale sits in its leafy suburb, surrounded by similar properties which sprang up around Brooklands, Addlestone and Kingston. There is no need for it not to do so for many years to come. No need except for the greed of the Shanly Homes company. 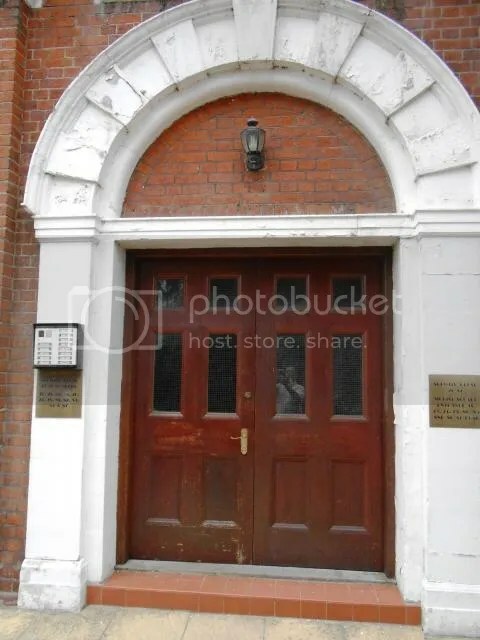 If you wish to register your support to preserve this handsome building you might wish to contact English Heritage’s relevant department in the south east. Alternatively Dom Raab is the MP for Esher and Walton who should be made aware of the contemptible actions of Shanly Homes – who are themselves available here. If one ventures to Canbury Park Road in Kingston these days it is hard to find anything to write home about. Just a slightly grimy offshoot of Richmond Road, opposite the railway station and nestling on the edge of Kingston’s dreaded one-way system. Yet by wandering up past the tattoo shop and continuing into suburbia for just a few hundred yards, one is actually in the presence of greatness. The buildings become a little outsized – and they echo of some of the greatest British engineering of all time. In December 1912, the 24-year-old aviator Thomas Octave Murdoch Sopwith purchased the Victorian roller skating rink which sat on Canbury Park Road. The fad for skating had passed and his needs were pressing – a smooth, clear floor was needed upon which to chalk out the lines of Sopwith’s home-made flying machines. Even then Kingston was a busy town and very much part of London’s south-western sprawl. 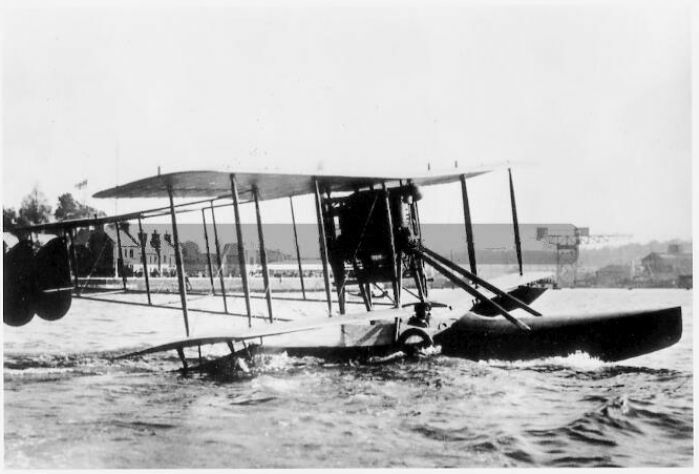 Ordinarily it would be an inconvenient place for building aircraft but as Sopwith specialised in fitting floats to his machines to take off and land on water he could – together with his mechanic, Fred Sigrist – easily hump his creations down to the River Thames and take off where it straightened out just north of Kingston Bridge. Although it was an age far removed from modern ‘elf and safety’ concerns, the influential River Thames Conservancy group took umbrage at such use of the river – and so too did the local constabulary. As a result, Sopwith tended to fly off at the first light of dawn – but later invested in a Daimler lorry for transporting new aircraft down to Brooklands, equipped with wheels rather than floats for undercarriage. Nevertheless, Sopwith’s seafaring aircraft were a hit. In 1913 the company’s most ambitious project to date was undertaken in partnership with the S. E. Saunders boatyard of East Cowes on the Isle of Wight, building the wood-hulled ‘Bat Boat’ which brought truly amphibious aviation to life. 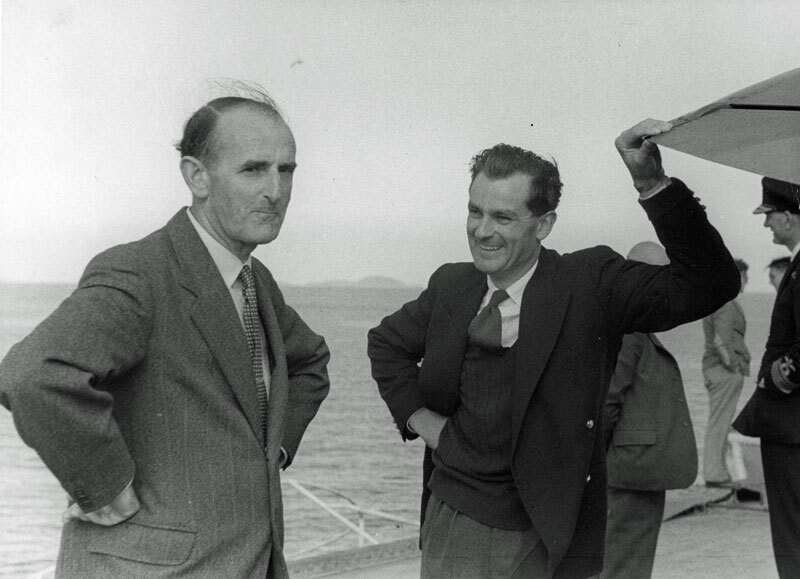 The success of these early models – the ‘Bat Boat’ was sold not only to the Royal Navy but also its Greek and German counterparts – saw the building of a factory in Woolston, Hampshire. Yet Sopwith retained Kingston as his centre of operations and soon there would be far more to the premises than the old ice rink. The First World War brought about a massive expansion to Sopwith’s factory. His delicate little Tabloid seaplane made the early running, but in 1916 he employed Yorkshireman, Herbert Smith, as chief designer – and Sopwith became a fabled name almost immediately. Smith’s first design was the two-seat 1½ Strutter, which finally gave reconnaissance crews flying over the Western Front sufficient performance to survive against Germany’s new breed of single-seat fighters. Then came his brilliant line of single-seat fighting scouts the Pup, Triplane, Camel, Dolphin and Snipe… all of which were born in the heart of Kingston. 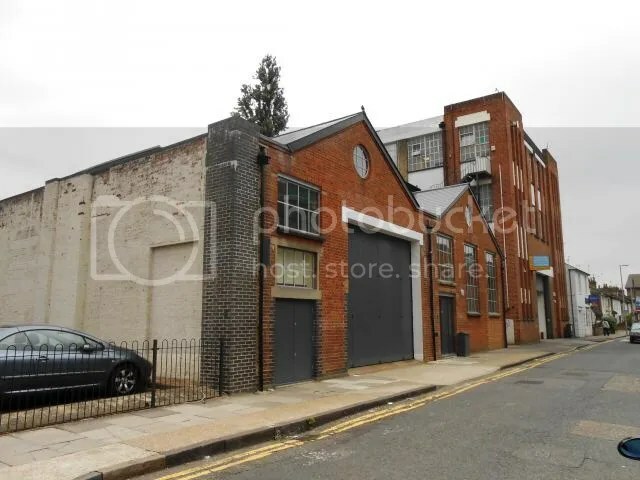 The original ice rink was supplemented by a saw mill and carpenters’ shop on Elm Road in 1914-15, doubling the size of the property, which doubled once again in 1916-17 with the addition of woodworking, paint and tinsmith’s shops. In 1917 the government also built a new ‘national’ factory at Ham, between Kingston and Richmond, which was also leased to Sopwith for the duration of the war. In total, Sopwith employed 5,000 staff and 16,000 aircraft were built – although many were sub-contracted to firms such as the Lincolnshire farm equipment manufacturers Clayton & Shuttleworth and Ruston Procter. If the armistice of 1918 declared time on ‘the war to end all wars’ then clearly, society had no need of fighter aircraft – and Sopwith was immediately in trouble. The Ham plant was reclaimed by the government and sold to Leyland to convert ex-military trucks to civilian use. By now Sopwith was a crippled firm which was also being pursued for Excess War Profits Duty. After a final, flailing effort to turn its wartime products into civilian aircraft and a doomed partnership with ABC Motorcycles, Sopwith went bust in 1920. From the ashes of one fighter firm came another, however, fronted by Sopwith’s chief test pilot Harry Hawker together with Thomas Sopwith, Fred Sigrist and Bill Eyre. The new firm, H.G. 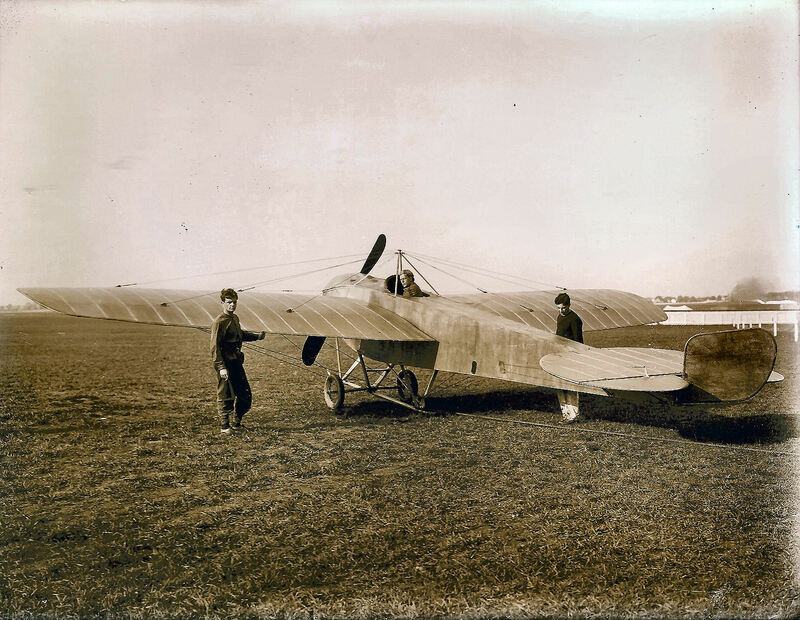 Hawker Engineering, started afresh – albeit from the Canbury Park Road premises – to build a string of world-class biplane fighters such as the Fury, Demon, Hart and Hind designed by Sydney Camm. In 1934 the renamed Hawker Aircraft Limited bought out Gloster aircraft and a year later merged with Armstrong-Siddeley to create an aviation conglomerate comprising Hawker, Gloster, Armstrong-Whitworth and Avro under the banner of the Hawker-Siddeley Group. Meanwhile life in Kingston carried on as normal. By January 1935, Sydney Camm had completed his initial design work on a new single-seat monoplane fighter with an enclosed cockpit, retractable undercarriage and eight machine guns: the Hurricane. When it flew from Hawker’s shed at Brooklands that November, the Hurricane laid the foundations of British air defence for World War 2. In readiness for the Hurricane – and doubtless with a weather eye on the increasing belligerence of Nazi Germany and the other fascist states – the site in Kingston was effectively levelled and a new factory complex erected in its place. The original administration building was retained – albeit in extended form – a while a nest of red brick sheds with slate roofs standing 2 or 3 storeys above Canbury Park Road. It was from here that the war work was carried out, with the various iterations of the Hurricane and Sea Hurricane being followed by the Typhoon and, by the end of the war, the Tempest and Sea Tempest. With peace and the arrival of the jet age it was clear that the Kingston plant could no longer cope with the demands being made upon it. So it was that Hawker left its home in 1948, moving back to the factory up the road at Ham which it had vacated 30 years earlier. The story of Hawker and the Hawker-Siddeley Group in Britain’s golden era of jet production can be told another day. For the Canbury Park site there was little sentiment – even if it was unique as the birthplace of more war-winning weaponry than any other factory in the world. 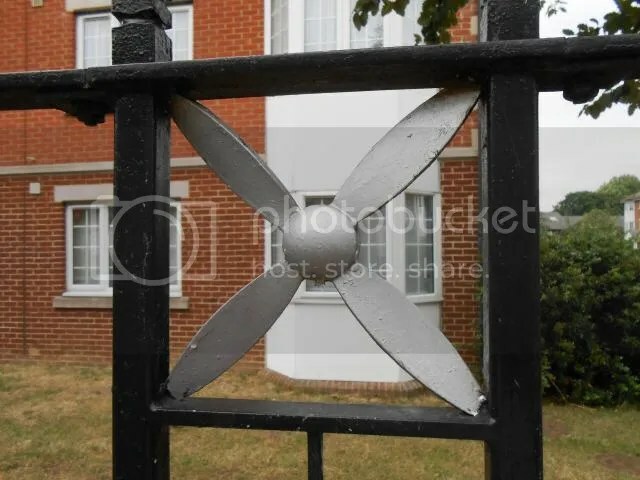 Today the most obvious link between the past and present is in the form of a wrought iron fence which features four-bladed propellers as a motif. This fence rings the original nerve centre of the factory, the design office and administration building, which dates back to 1914 and updated in 1935. From here the great Sopwith and Hawker designs of two world wars first emerged and it is an impressive edifice, blending a little bit of all styles from Georgian to Art Deco – which doubtless made it a mouth-watering prospect for the developers. Today this is one of the Ritzier residential plots in Kingston and a highly desirable address. Around it one or two of the 1935-era industrial buildings remain, red bricked and metal trussed, such as the Experimental Shop. 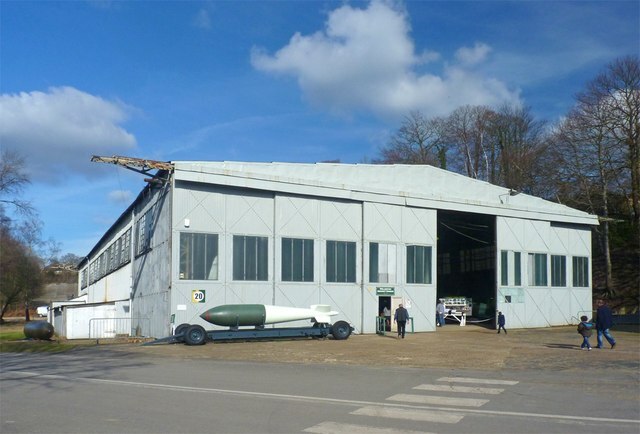 Some are a little careworn, but they do at least remain, and will continue to do so under Grade II listed status – the surviving parts of the oldest purpose-built aeroplane factory in England. There has been some good news of late for those who seek to preserve and promote Britain’s aviation past. The Heritage Lottery Fund has decided to give backing to the Royal Air Force Museum at Hendon and the Brooklands Museum. As a result, the RAF Museum has received £74,500 to develop a special exhibition to celebrate the centenary of the First World War in 2014. 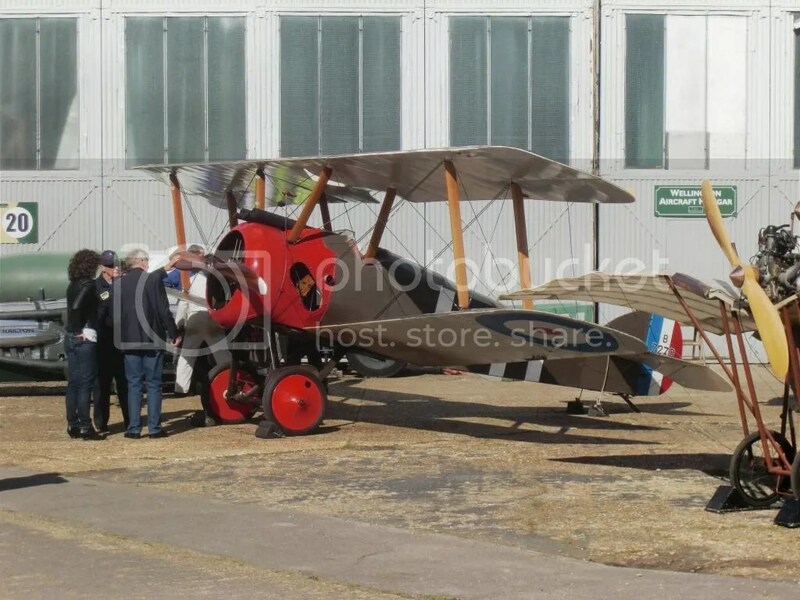 The museum in Grahame Park Way will display a collection of planes, letters, film and photographs depicting what it was like to be involved in the earliest days of the Royal Flying Corps. 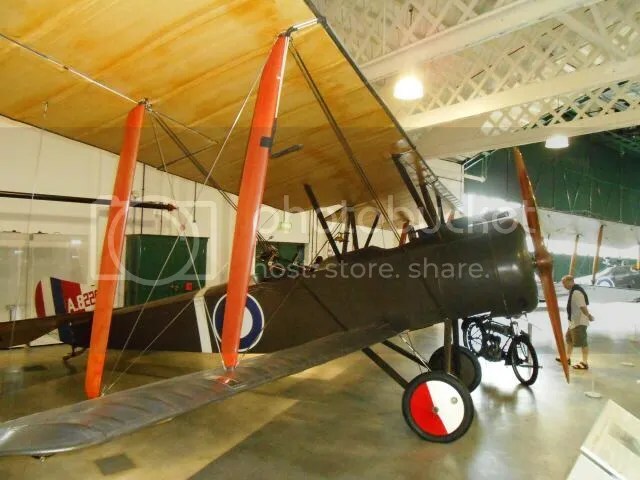 For its part, the RAF Museum still hopes that this is only an installment, as it has set a target figure of £706,300 in order to complete its plans for the exhibition, which will be housed in the Grahame-White Factory, built in 1915 and moved brick-by-brick from its original location to the RAF Museum site in 2010. 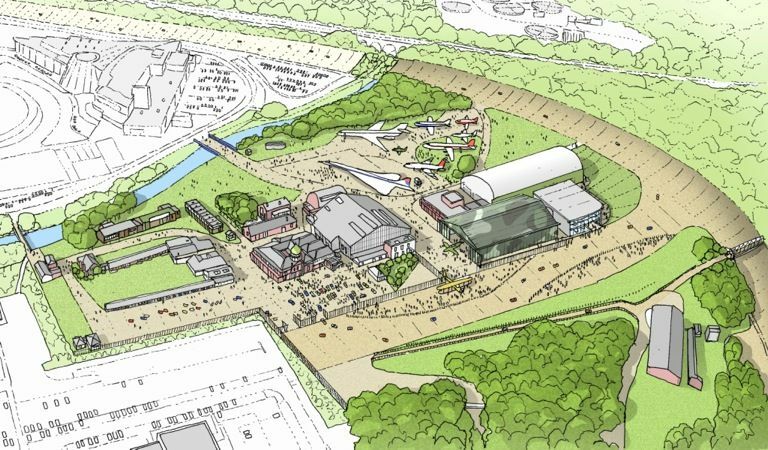 Meanwhile to the south west of London, Brooklands has has received a first-round pass for a £4.85m bid from the HLF for the Brooklands Aircraft Factory & Race Track Revival Project. In a similar move to that of the Graeme-White Factory, the plan is to relocate the wartime Wellington Hangar, built in 1939-40 on what was the race track’s celebrated Finishing Straight, to a new location on the infield. 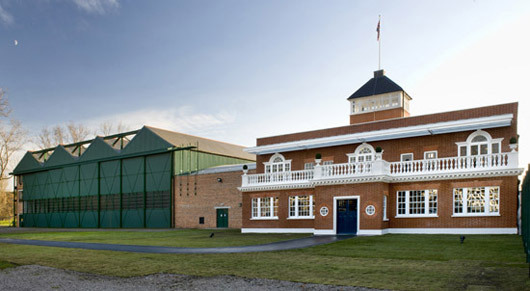 The Grade 2-listed building will then be refettled as The Brooklands Aircraft Factory, with a new annexe to house more of the museum’s outstanding collection of historic aircraft while the section of track which will be revealed after more than 70 years will also be renovated to allow more motoring events to take place. The initial funding allocated in this first-round pass for this project is £286,500, to which the museum will add further cash and volunteer input to allow development work to a total value of almost £410,000 to be undertaken. It is then required to apply for the remainder of the full grant in 2015, once the initial work is approved by the HLF. For a decade after the Wright brothers achieved powered flight the received wisdom was that if an aeroplane moved more than 20 degrees off the straight and level in any direction it would tumble from the sky. 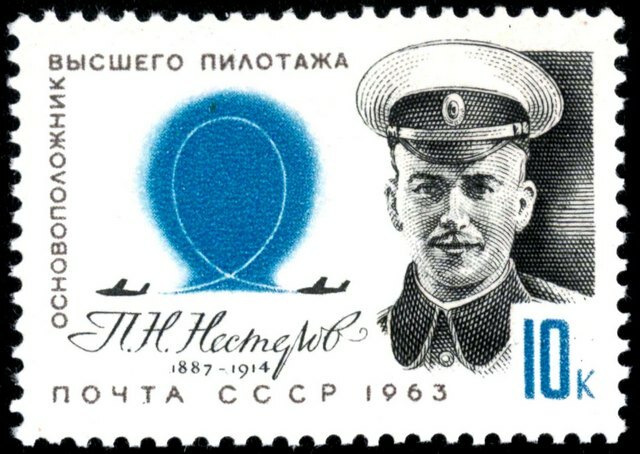 This was true for many of the pioneering aircraft of the day but Russian pilot Pyotr Nesterov turned the theory on its head in 1913. Nesterov was the son of a career army man who attended a military school and then enrolled in the Tsar’s artillery in 1904 . In 1909 he encountered aircraft for the first time in their role of performing reconnaissance flights and spotting for his gunners – and to the adventurous 22-year-old this seemed like a spectacularly good wheeze. In short order he began pilot training, qualifying as a pilot and then earning military pilot status. Not only was he talented at the controls but he also dedicated his time on the ground to thinking about strategy and tactics for the military use of aeroplanes. This included the possibility for an aircraft to fly in a loop if it needed to take evasive or aggressive action – and on 9 September 1913 a large crowd gathered at Syretzk Aerodrome near Kiev to see theory put into practice and successfully fly a loop in his Nieuport IV monoplane. Within days the move was then copied by aspiring pilots across Europe and ‘looping the loop’ became a major box office success in that last year of peace. The birth of aerobatic displays came just in time to pre-empt the dogfights which would follow soon afterwards the course of the Great War. For Nesterov that war would be measured in days. He encountered an Albatros reconnaissance aircraft on 8 September 1914 and attempted to shoot it down with a pistol. Having failed in this attempt he then tried to bring it down by using his undercarriage to give the German aircraft a glancing blow on the wing – but he misjudged the move and clattered into the Albatros so hard that while he did indeed inflict fatal damage, he fell out of his own machine and tumbled to his doom. Uniquely for an officer of the Tsar’s armed forces, Nesterov remained an officially approved hero in the Communist regime. Indeed, Stalin renamed the city of Zhovkva in his honour in 1951, but its original moniker has since been restored.